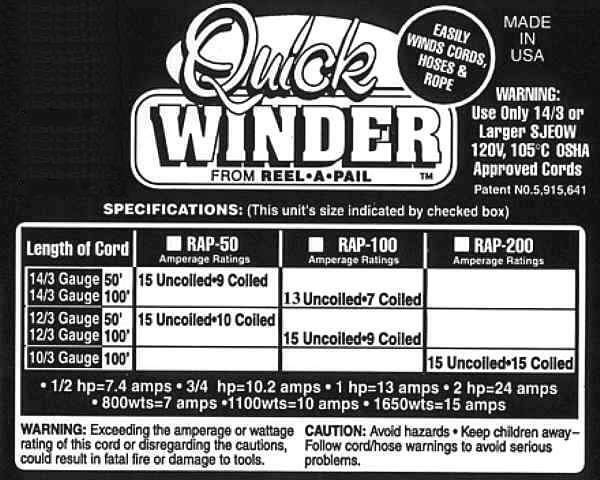 The QuickWinder Reel System has been UL listed, and has been tested for the amperage ratings for "cords in a coil usage". As a rule: one should always follow your cord manufacturer specifications. Lighter gauge cords deliver less amperage per foot of cord length, therefore produces more resistance which can translate into heat buildup! We recommend using 14/3 or larger gauge cords in any application. When used intermittently, (small power tools etc.) resistance buildup is minimal when using the proper cords. When using recommended cords in a coil, follow the amperage ratings on the label shown below. When in continuous heavy use, if your amperage ratings exceed specifications uncoil your cord. Some power tools will burn out in 5 minutes or less in severely starved conditions. Always be aware of the amperage ratings of your tools and your cords. To prevent dangerous resistance heat buildup, especially in light gauge cords, always uncoil completely when operating under heavy loads. Generally, a 12-3 extension cord will handle a single tool. Always use 10-3 extension cords when multiple tools may be running at the same time. Please follow extension cord safety procedures.